The photograph titled No Osprey, which won the highest award in the high school photography contest commemorating the 40th anniversary of Okinawa's reversion from U.S. rule to Japanese sovereignty. When Higa read the newspaper on the morning on September 30, she realized that the gates of Futenma Air Station had been blocked. Wondering what was happening, Higa picked up her camera, and went to the Samashita Gate, which is located close to her house. She spoke to one of the people on the sit-in protest, and asked for permission to take pictures of the people. Realizing Higa was a high school student, the man agreed straightaway. Higa got to three of the gates to the base, Samashita, Ooyama and Nodake, but almost had second thoughts at the tense scenes she witnessed in front of the Oyama and Nodake gates. 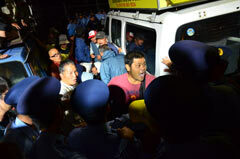 The protesters shouted, “The police are supposed to protect citizens! Why are you protecting the United States?” Higa pressed the shutter button for all she was worth as the police officers tried to remove the people on the sit-in protest and the cars parked in front of the gate.